Political scientist Keith Krehbiel developed an interesting theory of legislative behavior called “pivot theory” – it’s often been applied to understand US Congressional behavior, but I just came back from a conference where I saw it applied to state legislatures as well. The gist of the theory is that parties matter far less than the ideological preferences of individual legislators, and that each vote requires finding the preferences of a specific “pivot” individual for the voting stage to identify whether the new policy will move forward or if the body will stick with the status quo (no new policy.) Where the vote is a simple majoritarian vote (50% plus one vote), the outcome reflects the preferences of the “median voter” – the legislator in the middle of the group ideologically. This matches what we usually think about legislation reflecting the will of the majority of constituents. The median legislator’s preferences should reasonably reflect the median preference across all voters in the larger constituency. However, where you have a supermajoritarian rule — like the veto override, where a motion requires two-thirds support — there’s an opportunity for gridlock, which Krehbiel helpfully defines as “not only stalemate in government but also the sense of majority disappointment or injustice which sometimes accompanies it” (1998, 26). Now, all of the preferences between the median voter and the veto-override point are disregarded, since gridlock is overcome by the legislator occupying the point 2/3 of the way along the ideological spectrum. This is a useful structure for thinking about our current situation, where gridlock has become a more regular occurrence. Even though we’re just a single state and so you might expect more intra-party homogeneity than we see at the national level, we know that there’s plenty of ideological variation across both parties’ state legislative caucuses so it does make sense to consider legislators’ individual ideological positions. Governor LePage vetoed LDs 1366, 468, 521, 49, and 1025 which all originally received unanimous support. ( I’m leaving the unanimously-supported LD 319, the internet sales tax study, out of the analysis because other measures besides support for the governor affected vote-switching on that vote: the Democratic leadership took the unusual step of encouraging their members to sustain the governor’s veto, so nobody voted to override that veto.) Above you’ll see a bubble-map of the number of Republican legislators switching their votes to sustain up to four (in the Senate) or three (in the House) of the governor’s vetoes. The benefit of looking at bills which had received unanimous support is that you don’t have to worry too much about support for the actual subject of the bill – you can assume that they’re reasonably non-controversial and that the median voter does indeed support them. There’s also a different calculus at stake depending on the size of the chamber. The Senate is less than a quarter of the size of the House, so defections from the party position have a much stronger impact on the outcome of the vote. In the House, different coalitions of members can be brought together to achieve the party position but also allow a rotating cast of members to vote their political preference. 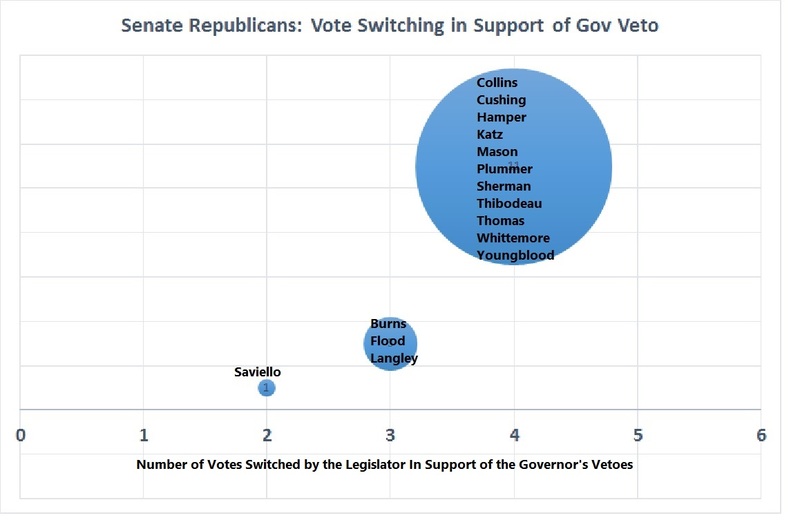 You can see how much more unified Senate Republicans are than Senate House members on the veto overrides: 75% of Senate Republicans always switched their original vote to support the governor’s veto, while only 5% of House Republicans always switched their vote. 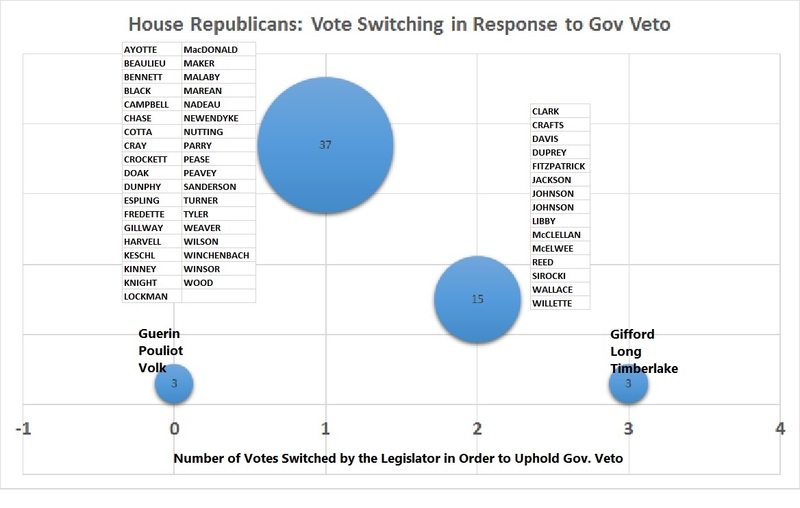 Another way of conceptualizing loyalty to the governor is by the number of individual votes which were different from the legislator’s original vote as a result of the governor’s veto. Over the four override votes I studied, 92% of Senate Republican votes switched to support the governor, while only 44% of House Republican votes switched. So what does this mean for pivot points? First, our pivot point is clearly in the Senate. The Senate is sustaining vetoes that the House is successfully overriding, so we should expect that our true veto override pivot is in the Senate. Furthermore, our Senate Republicans are not 100% supportive of the governor’s veto. Either Sen. Saviello, Sen. Burns, Sen. Flood or Sen. Langley must support the stauncher eleven loyalists in order to achieve the 12 votes needed to sustain the governor’s veto. On our MaineCare bill, Sen. Katz tried to achieve a veto-proof majority in the Senate and got pretty darned close. Sen. Langley and Sen. Whittemore, though they voted against it, did co-sponsor the bill, which seems to indicate that they might be persuadable (in a more logical world, it would mean that they would vote for it, but I obviously still have a lot to learn.) Katz plus Langley, who has been willing to break with the governor on at least one other vote, would be one kind of pivot point. Sen. Flood may serve as the beginning of a pivot point for the governor’s planned veto of the biennial budget. As a member of the Appropriations Committee he might be willing to support the hard work they did to create a compromise by overriding the veto. However, he’d need to find at least one other Republican to join him on the pivot point. Sen. Katz, care to make a trade? This entry was posted in Health Care, Maine Legislature, Veto, Voting Behavior. Bookmark the permalink.